Fresh herbs all winter long, growing right in my kitchen! I absolutely LOVE this thing. It was simple to set up and needs almost no maintainence at all, except for some water and nutrient tablets every 2 weeks. 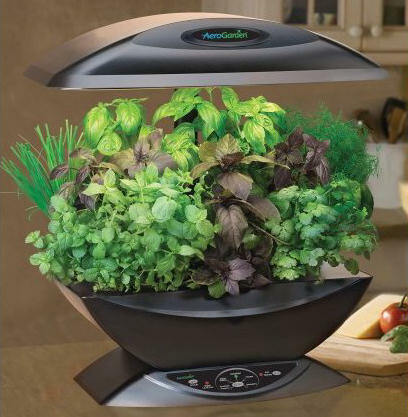 You don't have to worry about keeping the plants in a drafty window: the aero-garden has its own built-in grow lights and they cycle on during the day and off at night. There's no dirt: just water and nutrients. It could not be more simple or fool-proof. If you love cooking with fresh herbs, you need this.